I can only imagine how concerned and worried you are. Sending healing thoughts and prayers your way. Thank you, Cindy and Louise! At his last feed late last night he didn't seem interested in his food, and only had 1 ml. I checked the heating pad was at the right temperature and let him rest till morning. But first thing this morning he didn't greet me as usual. He was very quiet, breathing slowly, closing his eyes often. There was still a little food in his crop. I gave him some warm electrolytes and a drop of Bactrim (TMS) and massaged his crop, hoping to keep him going until the vet's opened. But he was very unresponsive and only managed to sip a few drops. A few minutes later he opened his eyes, took a deeper breath and then snuggled into my hand and closed his eyes again for the last time. Thank you all so much for your kind words and thoughts, and for all the advice and encouragement. We'll just have to believe he's flying high now, free of the cares of this world. Oh Teresa my heart goes out to you Poor little Xi-Ri after all his struggle to live. You did everything possible to save this little one Even though his life was destined to be short I'm sure you learned so much from him. I am so, so very sorry, Teresa. Chuck had to rush over to the lab but the last thing he asked me before he left was if I had heard how Xi-ri was doing. I told him no. And I know the first thing he is going to ask me when he returns is have I heard anything yet. He, as well as all of us, fell so in love with the little darling. Bless your heart for doing everything possible. Bless you sweet Xi-ri. May you forever fly high and fly free. Teresa...words can't express how sorry I am. I'm so sorry that Chuck will have bad news to come home to but it may help that he passed away very peacefully -- and there's Arislan, he's fighting for his right to live, and I hope with all my heart he'll make it. Oh Teresa, I am so very, very sorry. Bless you for all you did to try to save him. Chuck is very sorry to hear about Xi-ri. You're exactly right, knowing he passed away peacefully is a blessing. I am very sorry Teresa. You did all your best. Xi-ri is finally rested now. Xi-ri's father passed away during the night. Yesterday morning my sister-in-law phoned to say he was 'very fat' (= fluffed-up) and I asked her to take him to my vet's asap. She didn't. Isn't it crazy that those who have money and transport are the ones who can't be bothered to lift a finger? She did promise, however, to take the hen to the vet's and get her checked up. I'm so sorry to read this Teresa I just hope that your sister does do right & take the hen to the vet. I know many people like your sister, they don't think twice about spending $$$$ on themselves BUT if one of their pets need vet care they just don't want to part with their $$$$. But on the other hand I also know some with lots of $$$$ & they don't think twice if their pet needs a vet. This is terrible news. I am so sorry, Teresa. I've got to wonder now if there wasn't something going on with the parents that was passed on to the baby. I do hope your sister in law does take the female in and that she is OK. I brought the hen home tonight -- and this time she's definitely getting checked out by the vet, as I will take her there myself. Poor little hen, she must be pining, because she's been pecking her own wing till it bled. Teresa, I am so happy that you have the little hen home with you. Atleast now you will not have to worry and wonder if she is being cared for and is getting the proper food, care and medical attention. Poor little thing, she lost her baby and then her mate. It's no wonder she is pecking at herself. She has been totally traumatized. I know you will give her all the TLC she deserves. I'm so glad to hear the little hen is in your possession, Teresa. Please keep us posted on how the vet visit goes. "Some people shouldn't keep anything but fluffy toys..."
Very good news to read Teresa I'm wondering if her picking at herself might be something other than missing her mate though? The vet couldn't find anything wrong with Nice (awful name, yuk! ), nor any reason why she should be self-mutilating apart from behavioural. Her poops looked much better today, too. I supposed she got frightened yesterday evening with all the goings-on about the neighbour's cats, and strangers trooping through the house. Last night, before going to bed, my daughter put a Tweety toy next to her cage. This morning she was 'talking' to him, and there was no evidence of recent pecking. So I bathed her wing (and the down feathers under it) with warm water with a few drops of Betadine, and she obviously enjoyed preening herself after that. She also enjoyed the walk to the vet's, and chattered all the way. There has been no more pecking since, but just to make sure I bought her a toy bird about her size and attached it to her cage. She's fascinated! As a 'just in case', the vet told me which antibiotic to use and how much if she should fall ill with a GI tract infection. Such wonderful news Teresa! I'm so glad she stopped picking & has found a new friend in the toy bird. Nice is such a pretty little yellow bundle ! 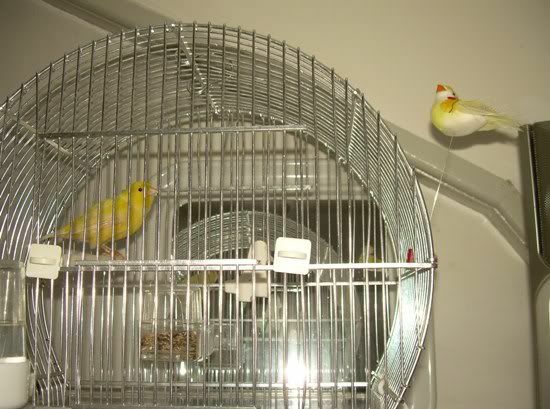 And that is just so like Soni to put the little tweety bird next to her cage so she wouldn't be alone.